Structural barriers have kept unemployment stubbornly high for young adults in Cleveland, and a vast gulf separates white youth from youth of color in success finding a job. A report released last month by Policy Matters Ohio, in collaboration with Generation Work, found that young Clevelanders across the board face unemployment rates five points higher than the median worker, despite being more likely to search for work. Among young people of color, nearly one in three is unemployed. Young Clevelanders are better educated than ever before, high school graduation rates are going up and many have or are working towards post-secondary degrees. Despite these gains in educational attainment, for young people living in Greater Cleveland, living wage jobs are hard to come by. Between 2013 and 2015, Clevelanders between the ages of 18 and 29 faced an unemployment rate of 13.8 percent, five points higher than the city as a whole, according to the report from Policy Matters Ohio. Three-quarters of this group already works or is actively looking for work – but they struggle to find jobs that pay a living wage. “Young Clevelanders want to work, but they either can’t find jobs or the ones they have pay very little,” said report author and Policy Matters researcher Michael Shields. “They tend to be concentrated in low-paying industries so young workers are especially harmed by a low minimum wage.” In 2015, Cleveland-area workers between 18 and 29 made 59 percent of the wages of the typical worker: $11.13 an hour compared to $18.78 for all workers aged 15 to 64. For young workers of color, the situation is even more difficult. Nearly one in three young black workers couldn’t find a job between 2013 and 2015. Years into the post-Recession recovery wages for young white workers remained relatively steady, but wages for non-white youth continued to fall, widening the racial gap. Compared to young white workers, young workers of color earned about 97 percent as much between 2005 and 2007, and about 81 percent as much from 2013 to 2015, according to the report. “Cleveland’s youth workforce is working harder to find a job and learning more than ever, but young workers —especially those of color — are earning stagnant wages or being sidelined by unemployment,” Shields said. “That’s a market failure and we can fix it.”The report outlines policy changes that could strengthen the labor market and make access to good jobs more equitable. Generation Work, a collaboration between public agencies, service providers, and philanthropic entities, was created to help young people overcome barriers that lock them out of good jobs, meet the challenges of a shifting labor market, and get a foothold on the career ladder. Generation Work partners are working together in new ways to implement proven practices, by training young people to work in high demand industries, aligning the supply and demand sides of the labor market to facilitate a better hiring process, and connecting young adults with quality jobs. Partners are committed to improving employment rates and wages for young adults, and to closing the gaps between white young adults and their peers of color. 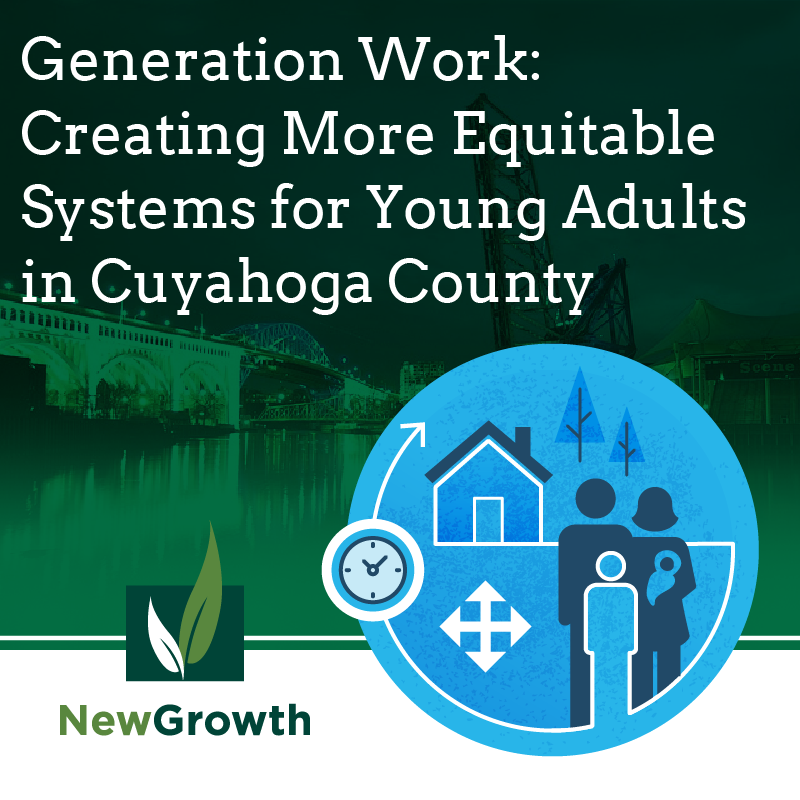 Because overcoming systemic barriers is vital to creating a more equitable system, Generation Work intentionally serves marginalized Clevelanders to bring them into the fold. Generation Work partners are using a three-prong approach to reduce disparate employment outcomes by race. By capturing the community’s attention about equity issues, raising awareness that current disparities are systemic and grounded in our history, and offering tangible actions to break down legacy barriers, we can create the momentum needed to build a more equitable and inclusive job market. To accomplish this goal, the Generation Work team is working with local partners and national experts. To capture the community’s attention, Generation Work has aligned efforts with Cleveland Neighborhood Progress’ Year of Awareness initiative. 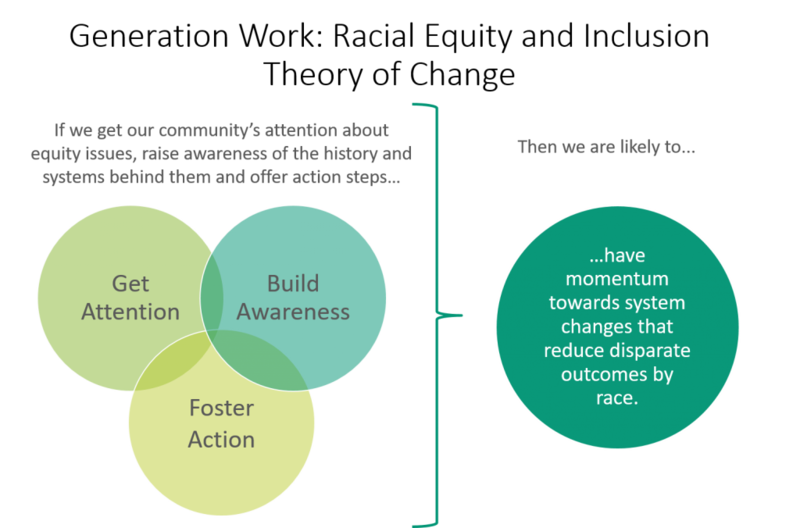 The Year of Awareness has brought monthly training sessions, led by the Racial Equity Institute to the region, which raise awareness of the systemic nature of disparities found in every outcome, from birth weights to crime rates. Generation Work has secured seats in the training for organizations who are represented on the Youth Council of the Workforce Development Board with the goal of raising the awareness of systemic barriers faced by young people of color face in securing employment. Those who receive training are being asked to participate in a racial equity and inclusion learning community to reflect and act on disparities in their own work. Through an investment made by the Annie E. Casey Foundation, Generation Work is partnering with the Race Matters Institute to analyze historical, political, and organizational factors which have contributed to current disparities. To make the results of this analysis accessible to a broader audience, a graphic visualization of how inequitable policies and practices that have built over time will be created. This work will be used to spark conversation in the community about policy and practice changes which can be made to address inequities. Using these community conversations as a springboard, Generation Work will pilot the Racial Equity Impact Assessment with the learning community fostered through the training with Cleveland Neighborhood Progress. Learning community members will use the assessment to analyze whether their own practices and policies are contributing to current disparities. Members will share the results of their assessments as well as steps taken to correct inequitable policies and practices. The results from the learning community will be shared to spread and scale best practices. Creating momentum among service providers is only one piece of the puzzle. Generation Work partners will soon begin to build strategies to engage the business community in conversations about hiring practices, job quality, and wages to help build more equitable and productive talent pipelines for both businesses and young adults. New Growth Group provides project management and strategic guidance for Generation Work. For more information about the initiative, please contact Kaci Roach.